JUBA (HAN) January 8.2017 Public Diplomacy & Regional Security News. South Sudan’s local currency (SSP) further weakened, in the first week of January, against the U.S. dollar ($) indicating the deteriorating economic situation in the oil-dependent country. On Friday, a 1$S sold for 105 SSP, which showed a significant surge from the $1 sold at 90 SSP late last year. A number of traders Sudan Tribune interviewed attributed weakening of the SSP to increased demands from families abroad and the scarcity of hard currencies. 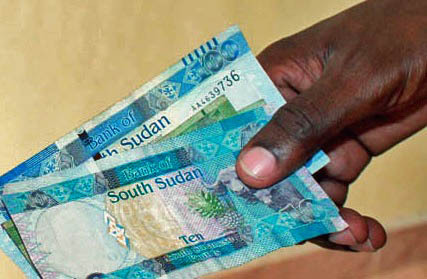 “People are sending more [U.S] dollars to their families in Uganda and Kenya and this has place a huge pressure on the black market and currency traders are maximizing their profits,” said John Ladu, a trader dealing in money exchange in the South Sudan capital, Juba. Maker Majok, another trader, concurs with Ladu’s views. “I have received more than ten phone calls since morning from my clients who are asking me to reserve them some dollars so that they can send to their families for school fees and house rental charges,” said Majok. South Sudan depends on export of crude oil for hard currency, but production has declined substantially since conflict erupted three years ago. The continuous decline in oil prices in global markets has further reduced monthly revenues for the young nation. In December 2015, the ministry of finance and central bank of South Sudan floated fixed exchange rate of dollars against South Sudan from $1 to 2.96 SSP in the central bank to $1 for 18 SSP in the black market at the time. The rate has doubled several times, prompting a surge in commodities prices. The recent weakening of SSP against the dollar, experts say, could also be attributed to high spending during Christmas and End of the Year shopping and lack of auctioning for dollars by South Sudan’s Central Bank.